With Thanksgiving almost here it's time to get cooking! Every year I make Pineapple stuffing in addition to the traditional type stuffing. It's so good I just can't help but eat it twice! Once at dinner and again with ice cream on it for dessert! Not only is it delicious, but it's easy to make and you don't even need a separate bowl. Just mix it up right in the baking dish! How's that for easy? 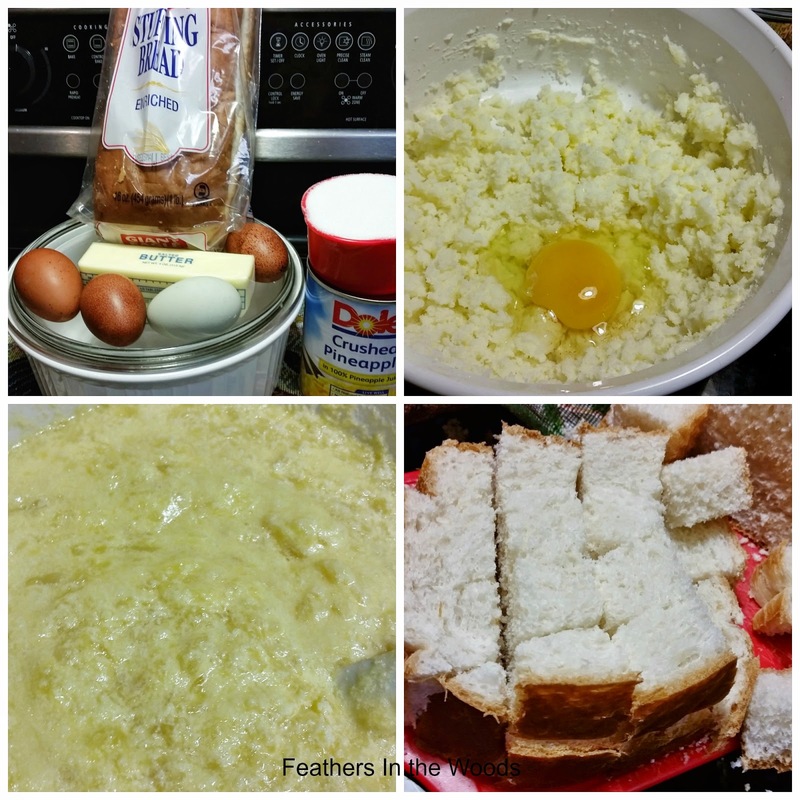 It only calls for 5 simple ingredients, and you probably have most of them on hand. So put on your apron, preheat the oven and lets make some stuffing! Preheat oven to 350. Cut bread into cubes about 3/4" in size. Combine sugar and butter in baking dish. Beat in eggs 1 at a time till creamy. Mix in drained pineapple. Add cubed bread tossing to coat bread with mixture. Make sure you get the mixture from the bottom of the dish and cover all bread pieces. Don't mix too vigorously! You don't want to mash up the bread, just coat it. Cover and bake for 1 hour. So, while we're talking about Thanksgiving and cooking and all that good stuff lets talk about food safety too. Did you know that 1 in 6 Americans get sick with food poisoning every year? 1 in 6! That's crazy! You should just see all the stuff I learned by checking out the Food Safety Website. I really like that website. Not only does it have lots of food safety information, but there is a page with all the latest food recalls. That's important stuff! Wrap and refrigerate your leftovers within 2 hours. Shallow containers should be used since they cool more quickly and evenly then deep containers. Consume refrigerated leftovers within 3-4 days. Don't forget to reheat solid leftovers to at least 165, and liquids like soups need to come to a rolling boil. Remember above all, that the bacteria that causes illness does not effect the taste, smell or appearance of food. There's really no way to 'tell' if your food will make you sick, but taking a few precautions can greatly reduce your risk of getting sick. After all...who wants to spend the holidays feeling awful? What a delightful idea! Happy Thanksgiving! 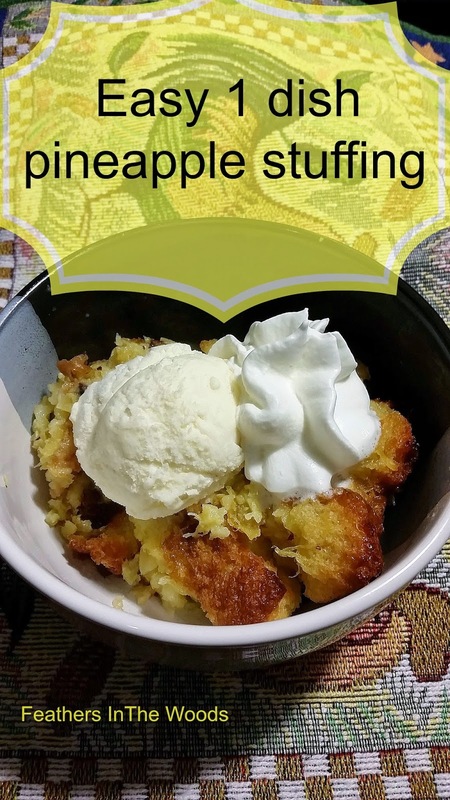 I have never heard of pineapple stuffing, but it sounds delicious! I'm thinking that it's kind of like a bread pudding. Pinning. Thanks for sharing with SYC.